Ah... summer! I can't wait!! I love nothing more than waking up and throwing on a t-shirt, pair of shorts and my flip-flops and eating my breakfast outside while reading the paper! It's pure bliss!!! Sadly... the weather in my neck of the woods is still a little cool, but I'm hopeful that sunny skies are on the horizon. So here's a freebie for May that also ties into my love of summer and my love of reading. Did I mention that I love to read outside... in the sun...with fresh lemonade nearby?? I've a giant stack of books I can't wait to sink my teeth into this summer! I created a set of Summer Poetry Bookmarks (like my Earth Day Poetry Bookmarks) - there are 32 bookmarks with two themes! There's a Beach Blue theme and a Sunny Orange theme and if you don't have access to a color printer you can ask the students to color them in themselves. 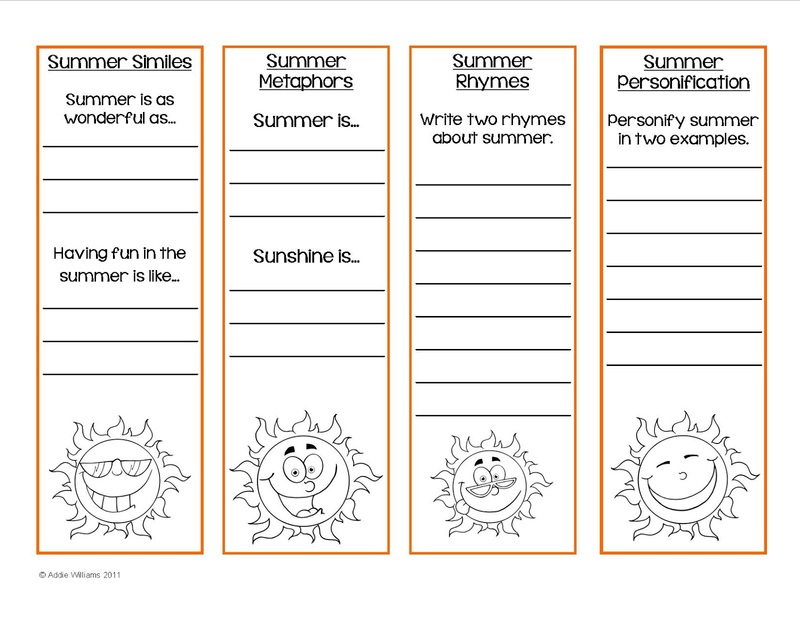 I've also included two summer themed writing papers for students to write a longer poem or to write down their summer dreams /hopes / wishes / goals etc. These bookmarks are a great review activity for figures of speech and can be given out with Summer Reading Lists, as a token from you at the end of the year, or just for a fun reminder of what they learned during the year. You can download the bookmarks simply by clicking the image below. Hope your Summer Break starts sooner, rather than later!! Here's to the lazy, hazy days of summer! PS - I just completed the 5-Star Blogger Challenge hosted by Charity at the OC Blog. Check out the list of amazing teacher bloggers who've linked up! Definitely a 5-Star Blog! Thanks for joining the party! Super cute bookmarks! I love to read outside, too.